The first U.S. well that pumped oil from the ground was built in 1859 in Titusville, Pennsylvania. The first forced-air oil furnace was invited in 1935 and shortly after, it became extremely popular in the United States. Heating oil comes from the refinement of crude oil. Gasoline, kerosene, diesel fuel, and jet fuel also come from this process. After it is refined, heating oil is a champagne color. It is dyed a rosy color so that it can be distinguished from diesel fuel. It is a very safe liquid. Believe it or not, if you were to drop a lit match into the liquid, the flame would be extinguished. In liquid form, it is non-explosive and can’t mix with the air to become explosive. In order to ignite, it needs to be vaporized. The inhalation of oil fumes is not fatal and there’s a very low possibility of carbon monoxide entering your home from using heating oil. Heating oil contains 35% more BTUs per gallon than natural gas. Compare heating oil and natural gas. Compared to all other heating sources, heating oil burns the hottest and will heat your home faster than any other fuel type. Today’s heating oil is 90-95% cleaner than it was in the 1970s. In addition, its sulfur content has been reduced by 93% since the late 80’s. When properly maintained, new heating oil systems create no soot, dirt, or odors in your home. A new, oil burning heating unit runs at 83% – 95% efficiency. Because of the efficiency of modern units, households are on average using 25% less heating oil each winter than in 1989. 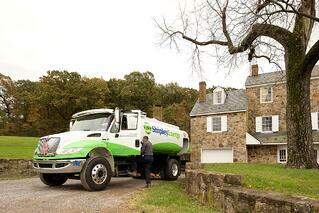 Shipley Energy has storage for heating oil and hasn’t run out of product in over 85 years. We have automatic deliveries, a no-run-out-guarantee, and an EZ pay system to make budgeting your life easier. Looking for a quote on a new furnace? We can help with that, too! Click below to get more information!